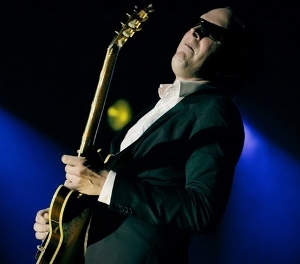 Although we’d of course heard of him by then, it wasn’t until quite a few years into blues-rocker Joe Bonamassa‘s career that he really caught our ear for the first time, when, in June 2010, we were fortunate enough to see him accompany Robert Randolph and his Family Band on a few songs during Eric Clapton’s Crossroads Guitar Festival, starting with “Further On Up the Road” before the group welcomed Italian guitarist Pino Daniele to the mix for a rousing take on Freddie King’s “Going Down”. Since then, we’ve covered much of what Joe has done, through varying degrees of bluesiness (including a revisiting of that latter tune as well as the instrumental “Hide Away” with fellow guitarists Derek Trucks and ZZ Top’s Billy Gibbons and Dusty Hill during King’s 2012 induction into the Rock & Roll Hall of Fame), but you can imagine our delight when we read that Joe would be following up his Muddy Wolf tribute at Red Rocks with a two-week tour and subsequent recording devoted entirely to the music of the “three Kings of the blues”: Albert King, Freddie King, and B.B. King. We didn’t get to see any of the 2015 Three Kings tour shows live, but thankfully, Bonamassa and producer Kevin Shirley were shrewd enough to capture the last of these shows in full, with the end result being the exquisite double CD, double DVD/Blu-Ray, or 4-LP Live at the Greek Theatre (J&R Adventures). Joined by what is essentially an expanded version of the band that backed him on the Muddy Wolf shows (swapping out harmonica player Mike Henderson and trombonist Nick Lane for a trio of female Australian backup singers and Paulie Cerra on saxophone), Bonamassa moves through 22 of the greatest songs from the Kings, beginning with half a dozen from Freddie. The set starts on a swinging “See See Baby” that features back-to-back-to-back solos from the two sax players as well as Bonamassa, along with some terrific playing from Reese Wynans on piano and organ, before the background singers join in on a swaying “Some Other Day, Some Other Time”, this time spotlighting guitarist Kirk Fletcher (who Bonamassa calls “one of the greatest modern blues guitar players in the world” during his introductions of the band) and Wynans in addition to Bonamassa. And that’s pretty much the way it goes for another 20 songs, where we get to hear plenty not only from Bonamassa (who solos at least once, occasionally several times, on nearly every song) but also from each of the other members of this talented ensemble, with the finished product serving as a masterclass around the team approach to the blues. The background singers, for example, are prominently featured on a slow, Ray Charles-ish “Lonesome Whistle Blues”, while Wynans and vocalist Mahalia Barnes each contribute superb solos on the breezy “Sittin’ on the Boat Dock”, with the latter’s powerful vocals reminding very much of Aretha Franklin. By now, the band has warmed up nicely, allowing them to deliver the last two – and arguably the finest – of their numbers from Freddie: the patient, stinging blues of “You’ve Got to Love Her With a Feeling” with its deep horns and sultry backing vocals, and a blistering, keys-soaked “Going Down” that adds a boogie woogie piano intro before the familiar, crushing opening guitar riff from Bonamassa. As good as those earlier versions of the song we heard from Bonamassa and friends at both the Crossroads festival and the Rock Hall induction were, the addition of the horn, background vocals, and keyboard parts here only help turn the heat up further, and will leave you feeling like you chugged straight from a bottle of hot sauce! From there, Joe and the band move on to a half-dozen from Albert, starting with a tempered, soulful “I’ll Play the Blues for You” that sees Bonamassa and Fletcher taking turns on guitar solos, and wrapping up on a shuffling “Oh, Pretty Woman” that Anton Fig helps close with a killer drum solo. In between, the band also hits another Ray Charles-like number (with Lee Thornburg‘s trumpet adding a bit of a New Orleans flair) in “I Get Evil”; a groovy “Breaking Up Somebody’s Home” that begins with some sassy, very Albert-like guitar and later finds Bonamassa sneaking in a riff from his “Dust Bowl” (amounting to a song so good that Joe has no choice but to end it with a big smile); the set’s most rocking number, a scorching “Angel of Mercy” that allows Bonamassa to show his chops both musically and vocally; and a “Cadillac Assembly Line” that starts with an almost reggae-ish sound and features jazzy, sometimes greasy, horns and strings-like organ. Bonamassa and crew get things swinging again as they move to the B.B. segment of the program with a “Let the Good Times Roll” on which Barnes assists on lead vocals, followed by the groovy “Never Make Your Move Too Soon”. “Ole Time Religion” is every bit like a religious revival, and the band is clearly having fun on the uptempo “Boogie Woogie Woman”, but the real gems here, in addition to the opener, have to be the slow blues of “Nobody Loves Me But My Mother” with its soothing, extended intro, taking us more than four minutes into the song before Joe sings a note, and a “Hummingbird” that’s as graceful as its name and that gives everyone – particularly the background singers – a thorough workout to wrap up the regular portion of the show. The band returns to the stage with an encore consisting of one more song from each of the blues royalty, beginning with a swinging take on Freddie’s instrumental “Hide Away”. That’s followed by a soulful, rock-steady “Born Under a Bad Sign” out of Albert’s catalog, and the night’s closer in B.B.’s “The Thrill is Gone”, as well as a studio version of John Hiatt’s “Riding With the King” with a chorus tailored to the occasion (“don’t you know you’re ridin’ with the Kings?”) and that again features Barnes accompanying Bonamassa on vocals. 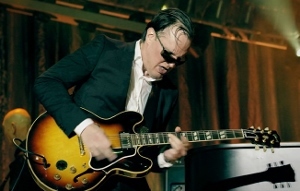 No one, of course, can play these songs quite like the masters themselves, so you really have to credit Bonamassa and producer Shirley for finding a way to present each of these tracks in a unique and interesting manner, including Bonamassa’s use of almost as many guitars – largely vintage – throughout the set as there are songs. Among these were a 1972 custom Flying V named Lucy originally owned and played by Albert King and borrowed from the collection of actor Steven Seagal, which Joe puts to use on both “I’ll Play the Blues for You” and “Born Under a Bad Sign”, as well as a 1958 Gibson Explorer that Joe plays on “Oh, Pretty Woman” and its sister Flying V behind which Joe rounds out the remaining Albert numbers, both once owned by Mick Fleetwood. 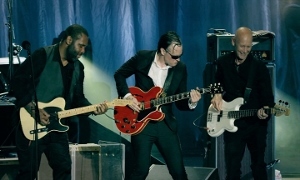 Bonamassa rotates through a red 1960 Gibson ES-345, a 1954 Les Paul Gold Top, and an early-1970s red Gibson ES-355 on the Freddie tracks, and a black, 2015 Gibson custom ES-355, a sunburst 1959 Gibson ES-345, and a walnut 1969 Gibson ES-355 on the B.B. songs, also pulling out different Fender Stratocasters for “Hummingbird” and “Riding With the Kings”. From the highs and lows of Freddie’s songs like “Lonesome Whistle Blues” – on which Joe offers some rare falsetto moans – and “Going Down”, respectively, to the soulfulness of Albert’s “I’ll Play the Blues for You” and “Breaking Up Somebody’s Home”, to the shouts of B.B.’s “Let the Good Times Roll” and “Boogie Woogie Woman”, Joe’s vocals function remarkably well across all three of the artists’ works, which is as much a testament to the keen song selection as it is to Joe’s voice. 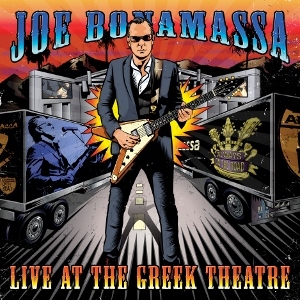 Bonamassa dedicates the set to his friend and longtime mentor B.B., who gave Joe his first big break when he invited Joe to open for him on the eve of Joe’s 12th birthday and with whom a young Bonamassa is seen pictured in the liner notes. Sadly, B.B. would pass away just two months before the Three Kings tour began, but thanks to Joe, the thrill of not only B.B.’s but also Albert’s and Freddie’s music still very much lives on through Live at the Greek Theatre. This entry was posted in Albums and tagged Albert King, B.B. King, Freddie King, Joe Bonamassa, Kirk Fletcher, Mahalia Barnes, Reese Wynans. Bookmark the permalink.